Did My Kids and I Lap Up “Dog Days”? Bruce Fretts: It’s a rainy summer Sunday, so I decided to take my 16-year-old son, Jed, and my 10-year-old daughter, Olive, to see Diary of a Wimpy Kid: Dog Days. Bruce: Jed, would you like to throw out the first pun? Bruce: …Or a total bow-wow? Jed: It burns like the sun… in summer. Oh, you! Bruce: This is the third in the series of movies, and we’ve seen all three of them together. I’d say I’ve liked each one better than the last, so this one is the top dog. Olive: Ohhhkay, yeah. I agree. Jed: Yes. I bow-wow-wow down to your notions. Bruce: But it’s not because of the dog. Olive: It barely has the dog in it. Bruce: Which is weird because they call it Dog Days, and they adopt a dog, Sweetie, but he’s barely in it. How did you feel about that? Olive: I was disappointed because you know me…I love dog actors. But Sweetie was only in two scenes. Bruce: He was cute, though. Jed: The movie was basically about Greg, and he didn’t really care about the dog, so I didn’t mind that Sweetie wasn’t in there much. Bruce: Yes, the movie was about Greg’s summer vacation before 8th grade. He lies to his father his father about getting a job at the country club so he can go there and hang out with Holly, his crush. He says early in the movie that all he really wants to do over the summer is sit in his room and play videogames all day. Did that seem familiar to anyone here? Jed: Um, no. By the way, I have to go to a retirement home and feed old people. Bruce: Really? You’re not going to be playing videogames? Jed: I’m not foolish, Father! Bruce: Did that remind you of anyone, Olive? Olive: JED! He’s such a liar! I know he was just joking but before this, he was probably playing his little football game up in his room. Jed: Olive, you Madden me! Bruce: In the movie, Greg has to sneak his big brother Rodrick into the country club, and I have to say, even though this movie isn’t called Rodrick Rules like the last one, I still think Rodrick rules. Jed: Yes, I love Rodrick so much. He’s me. Olive: He is really just kind of a Jed. Jed: I had a Löded Diaper when I realized how much he reminded me of me. Jed: I play in a band in my mind. Bruce: And he wears a lot of eyeliner–I’ve never seen you do that. Jed: I know that I’m pretty–I don’t need to pretty myself up. Bruce: Greg goes on a vacation with his best friend Rowley’s family, who are really square and just want to sing “5,000 Bottles of Milk on the Wall” and play games like “I Love You, Because…” So let’s play that game. Olive, I love you because you’re so cute and funny and sweet. Olive: Jed, I like you because you always help me out with videogames. Jed: Olive, I love you because…um…you’re just…good. Bruce: So it’s not a very fun game, is it? They ride this thing called the Cranium Shaker when they go to the amusement park. I don’t like rides like that. Do you? Jed: I love rides like that. Olive: I like the fair games. Bruce: I saw a report on TV that they’re all fixed and you can’t win them anyway. Olive: WHAT? 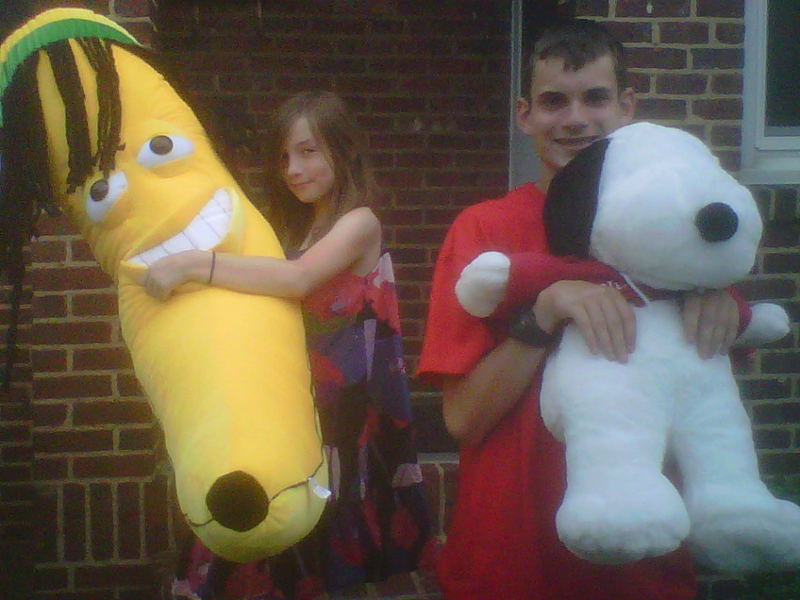 OLIVE MADE A HOLE IN ONE AND WON A GIANT RASTAFARIAN BANANA! Bruce: That was a weak spot in the plot, but I like the actors in the movie so much that I was willing to forgive it for flaws like that. The cast is really great, and Steve Zahn is especially hilarious as Greg’s dad. He’s just such a big dork. That wouldn’t remind you of anyone around here, would it? Bruce: Awkward silence! But he’s a lovable dork, right? Bruce: I just like these movies because they’re sweet and gentle and funny. They’ve got a few gross jokes about dog spit and poop, but they’re pretty mild. Did you and your kids hold this Diary dear? Post a comment! « Should You and Your Kids Engage in “Paranorman” Activity?